The recent improvement in the weather has triggered a burst of insect life as they respond to the early summer heat. This has shifted the hazards as I run the local lanes, from leaping giant puddles to avoiding swallowing the local insect fauna. Whilst on a slower ecological circuit, I was drawn to the numbers of flies, beetles and bees feasting on the abundant Alexanders flowers and other plants. It was however a red and black ladybird-coloured insect that particularly caught my eye, poised on a nettle. I took a couple of images before my macro lens became too intimate with the beast and in a flash it was gone. 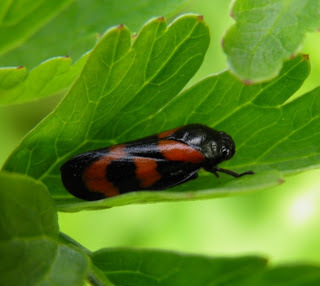 Back at home I was quickly able to identify it as one of our most visual frog hopper species, the Red-and-black Froghopper (Cercopis vulnerata). These bugs are also known as ‘spittle bugs’ and cuckoo-spit insects’, due to their nymphal stage habit of living in a protective mass of froth or spittle (Chinery, 1977). When it comes to jumping stakes, few would bet against the flea when taking account of relative body weight. It turns out that froghoppers, such as C. vulnerata, produce a substantially better jumping performance. Starting with my puddle leaping efforts with a take-off force of about 2-3 times my body weight, the flea manages about 135 times, and froghoppers more than 400 times (Burrows, 2006). This is a very useful if you want to avoid predation or being eaten by a grazing cow. Researchers have shown that the key to this jumping performance is a spring-loading mechanism called the ‘pleural arch’, which the insect compresses like an archer’s bow in readiness for leaping to safety (Patek, et al., 2011). It is even cleverer than this when you consider the materials used to form the pleural arch; a sophisticated combination of chitinous material to store energy and ‘resilin’ to provide flexibility and shape restoration, has drawn comparisons with high performance composite bows (Patek, et al., 2011). Such innovative mechanisms adopted by insects has inspired engineers and biologists to consider applications for human inspired devices. If we get another wet spell as bad as this April, I would be interested in a ‘human friendly pleural arch’ device to better avoid the puddles. Burrows, M. (2006) Jumping performance of froghopper insects. Journal of Experimental Biology, 209: 4607-4621. Chinery, M (1977) A Field Guide to the Insects of Britain and Northern Europe. London: Collins. Patek, S.N., Dudek, D.M. and Rosario, M.V. (2011) From bouncy legs to poisoned arrows: elastic movements in invertebrates. Journal of Experimental Biology, 214:1973-1980.